After four new consecutive files, the new issue of Shonen Sunday (#27) announced that the Detective Conan manga will once again resume its hiatus until “early summer“. 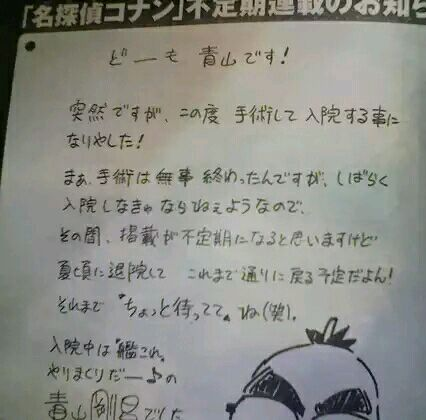 Starting from issue #28, Shonen Sunday will once again publish reprints of old Detective Conan files. No specific date was given for when exactly new files will be published again. As previously reported, Gosho Aoyama announced in March that he had recently undergone surgery, and while the operation was a success, he would be remaining in the hospital until summer. Issue #22/#23 of Shounen Sunday announced that a new Detective Conan manga file will be published on May 13, with the magazine’s 24th issue. This will be the first new file to be published since the hiatus started in March due to Gosho’s hospitalization. Issue #22/23 teases that the story of the new file (#921) will focus on Ran and Shinichi, and will tell how they first met. 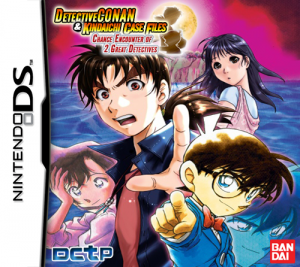 It is not yet known whether Detective Conan’s printing will return to its regular schedule after File #921, or its publishing will remain irregular. As previously reported, Gosho Aoyama announced in March that he underwent a surgery, and while the operation was a success, he still had to stay in the hospital until the summer. 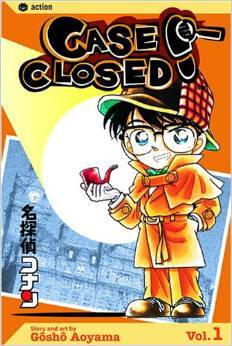 For the past month, Shounen Sunday reprinted old files of Detective Conan: #156-159 (the first case to feature Kaito Kid in Detective Conan). In addition to Gosho’s personal message, Shogakukan reports that Gosho already went in and out of hospital repeatedly last year, but decline to specify his illness for privacy reasons. After File 920, which will be published in this week’s issue (SS #16), there will be no new file in issue #17. It is still unclear whether there will be a new file the following week (#18). Starting from issue #19, Shounen Sunday will run reprints of old Detective Conan files. When and how often new files will be published during Gosho’s hospital stay is still unclear. The pool case is solved and … ?! 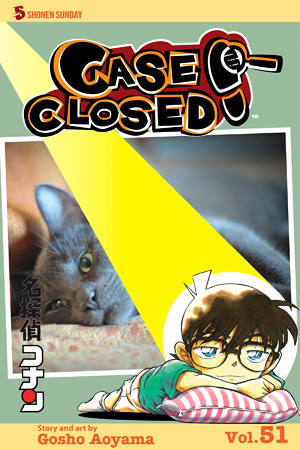 Case Closed continues to be published regularly in North America and related territories, where they have now surpassed fifty volumes. Volume 51 went on sale July 8th and is available both in paperback and digitally from various retailers. Those interested in the physical version may purchase it from several vendors, including Amazon, Barnes & Noble, Booksamillion, and RightStuf, while the digital version is available from the VIZ website, Amazon Kindle, Nook, and the iTunes Book Store. You can also pre-order Case Closed Volume 52 now on participating retailers for an expected release date of October 14, 2014.